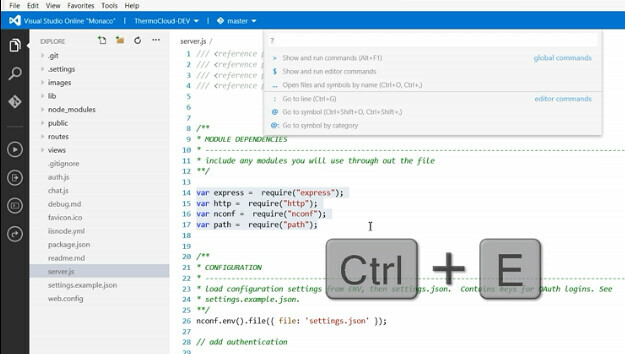 One of the most interesting announcements at the Visual Studio 2013 Launch today was the Monaco editor in Visual Studio Online. After the announcement today, I dug up enough info to be dangerous and took it for a quick spin. Quick disclaimer: this is me playing around for a bit, it's not an official announcement. 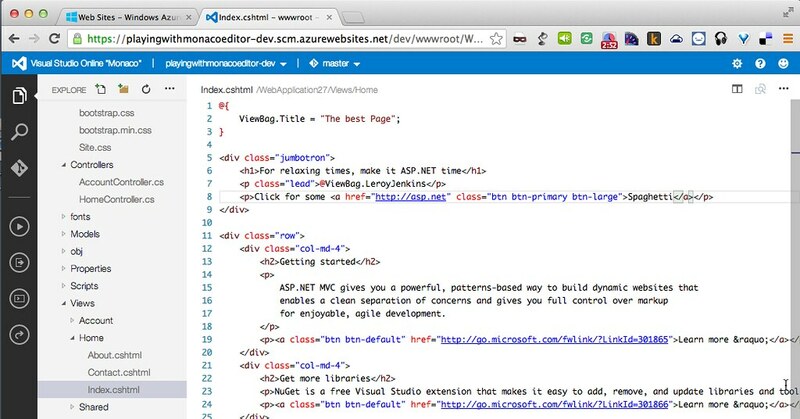 Visual Studio 2013 Launch: Announcing Visual Studio Online - Soma's announcement post gives a quick overview. More importantly, it links to a series of videos on Channel 9 which overview the Monaco editor and demonstrate using it in a few different scenarios. Channel 9 series: Visual Studio Online "Monaco"
I'll embed some of these videos at the end of the post - not here, or you'd get distracted and you'd never read the rest of the post, right? 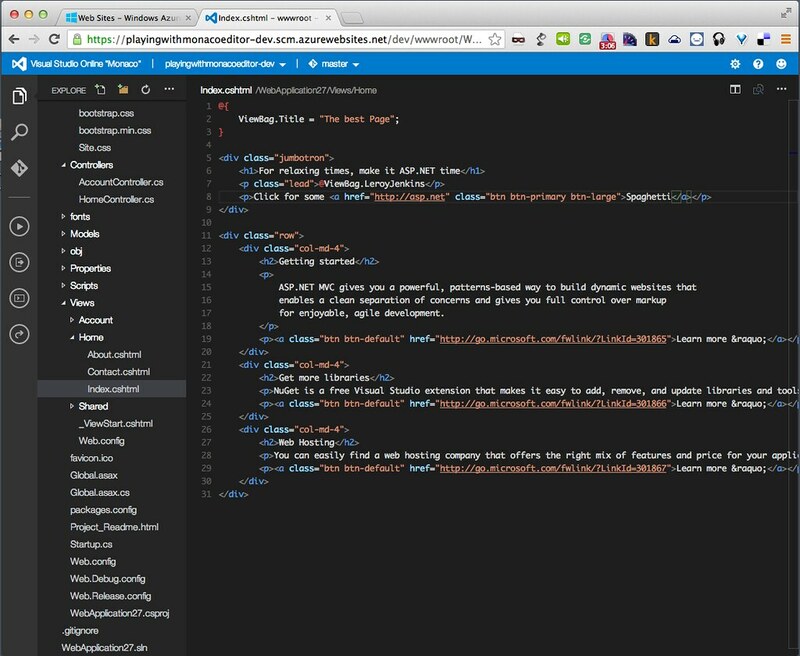 The big one: Visual Studio Online updates post on the Visual Studio Online features timeline news feed thing. Can I call it a blog? I just don't know. But it's wonderful. 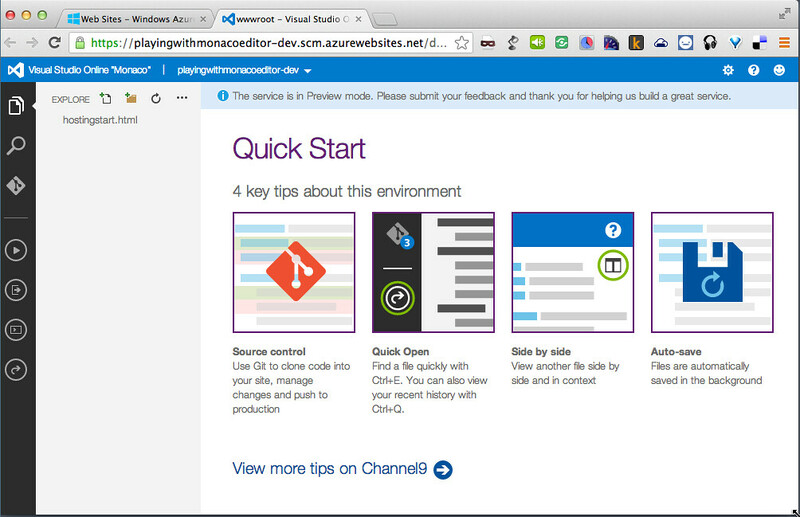 Specifically, the Announcing Visual Studio Online “Monaco” section shows how to turn it on and get started. Full disclosure: I tried bumbling my way through this and made a mess, then went crying to David Ebbo for help. He set me straight. 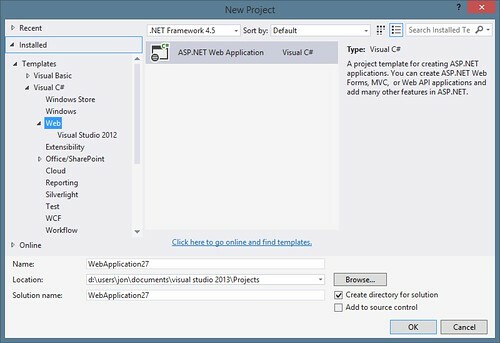 First, I'm going to create a new ASP.NET site in Visual Studio 2013 and deploy it to git. 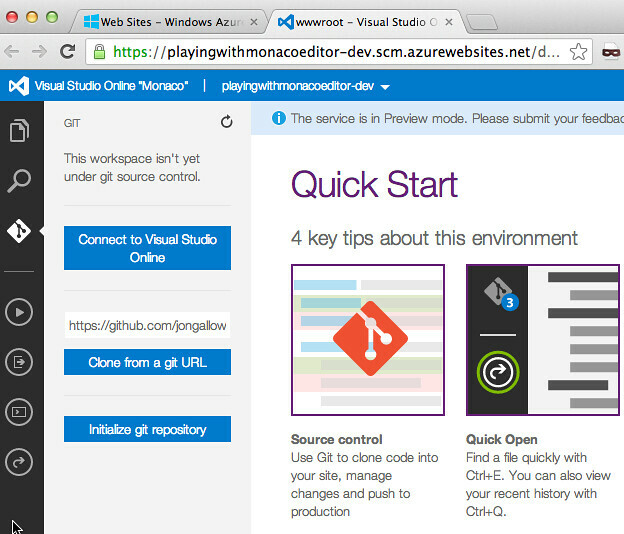 Now, I could use Visual Studio Online's git hosting - of course it works well, and works with the Visual Studio Online Monaco editor. But you'd suspect some tricky business, so I'm going to use a GitHub repository. So, I'm creating a simple ASP.NET MVC 5 application (with no authentication so I don't need to deploy a database) and pushing it to a GitHub repository. Now I'm dropping in a standard .gitignore and initializing the repo, then pushing to GitHub. 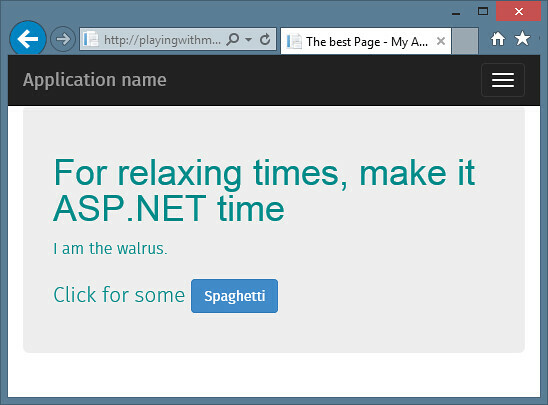 Now I'm going to create a new Windows Azure Web Site using that GitHub repo as the source. This has been available for a long time, but I'm showing the steps in case it's new to you. Okay, we've got a live repo and the site's deployed. 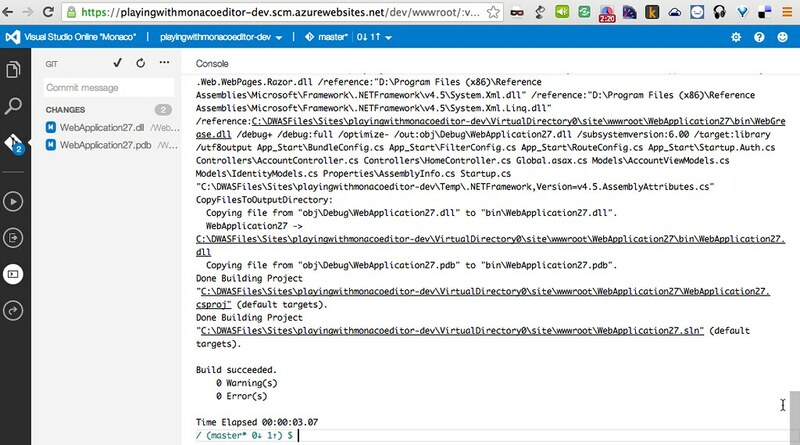 Now we want to edit that source using Visual Studio Online. 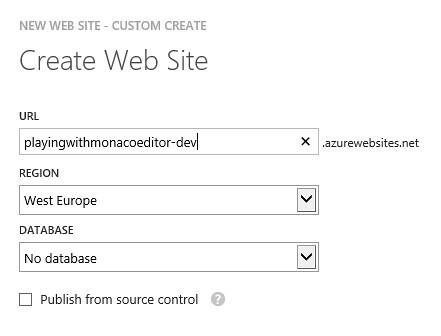 Here's the trick I learned from David Ebbo - you want to create another Windows Azure Web Site that's just associated with the source, not the deployment. So I head back into the portal and create a new Web Site just for source editing. Oops, I created it in Western Europe. Good thing the internets are fast. 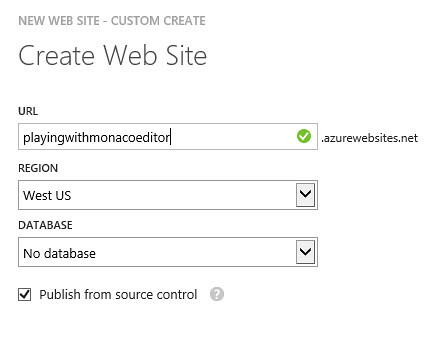 Now, in the new site, I head over to the Configure tab and enable "Edit in Visual Studio Online". Can you feel it? We're almost there. Promise. 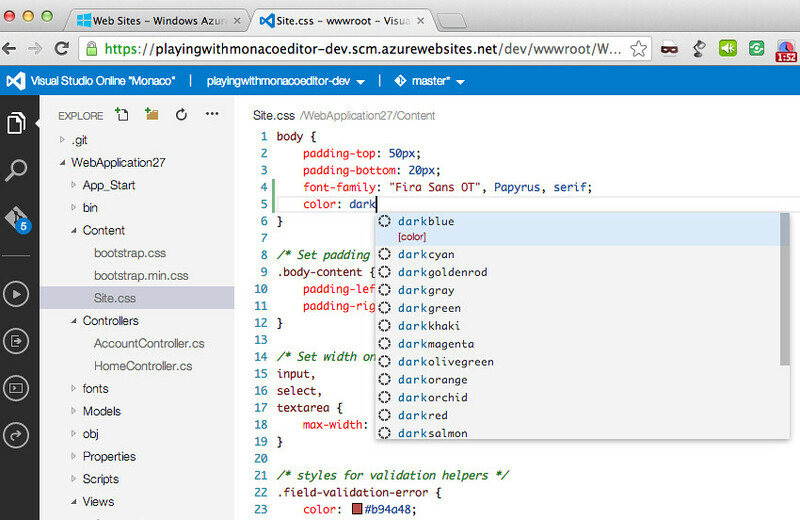 Now I head over to the Dashboard tab, and click on the Edit in Visual Studio Online link. Like you, I can hardly contain my excitement! What will happen? Oh, a login prompt. Hmm. Wait, you're not impressed because I used IE, is that it? You wanted me to see if it worked in another browser? Yeah, maybe this is an opportunity to dust off that Mac Mini to see how it does there. Hold on, it's over here somewhere. Under the... oh, that bill's overdue. Hm. Behind the... oh, there it is. Okay! 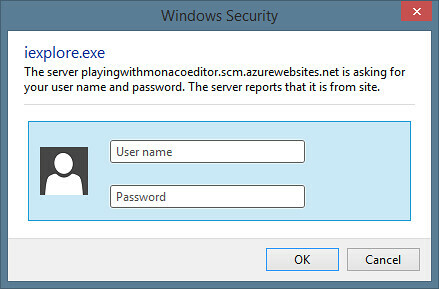 So I log back in to the Azure portal on click that same Edit In Visual Studio Online link. Hey, there it is again! I'll show this screenshot bigger this time. Now I click on the git icon on the left side and enter my git url, then hit clone. Okay, that looks really cool, and my code's visible on the left. Before I start editing, I want to make sure I can build it. 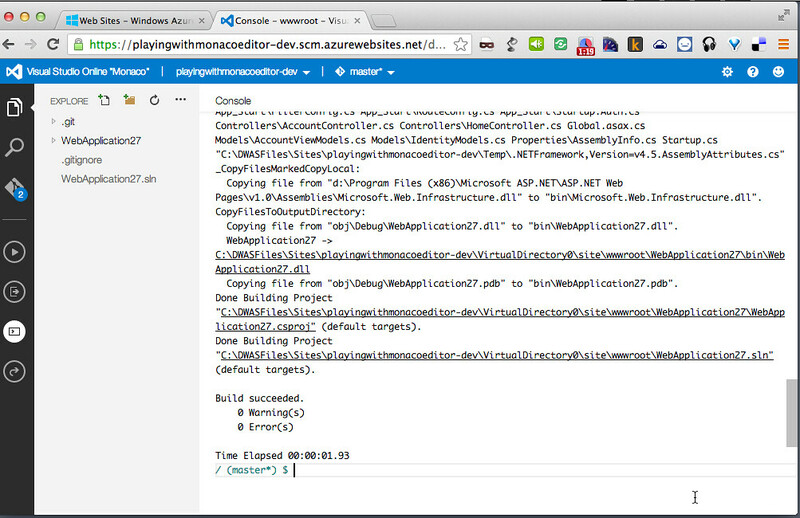 In the console window, I'm going to type in "msbuild" and cross my fingers. Oh, it did work. Well, hey there. 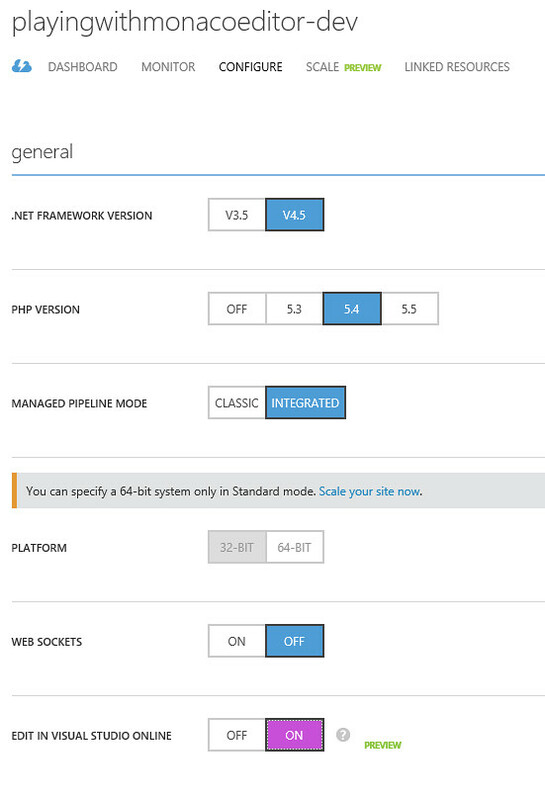 So, back on my Windows box, here's what the site looks like in IE11. Step 5: Do some editing. That's what started this whole mess, remember? First I edit the HomeController to add something to the ViewBag. Next I edit the CSHTML, adding in some HTML and C# changes. Finally, I make some CSS edits. I'm kind of rushing through this, but there's code completion and IntelliSense all along the way. For instance, when I start editing a CSS color, I get a dropdown with available colors. When I select a color, I can see what it will look like in the editor. Now I build to make sure it's all still good. And git push to deploy. And hopping back to my Windows / IE 11 browser, we can see that it works. Why did we do this? What did it buy us? Well, for one thing, we grabbed an ASP.NET repo from GitHub in a browser, on a Mac, made some code changes, and deployed it. 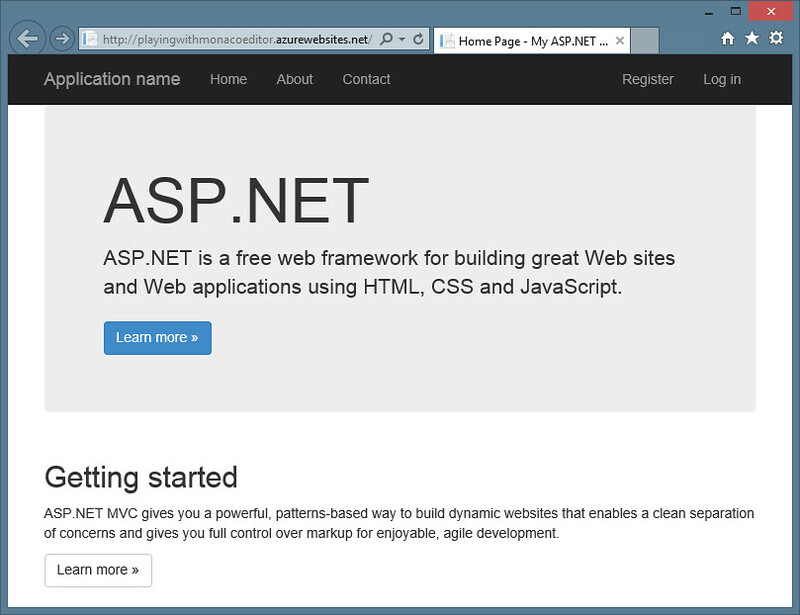 If you've got a browser (free) and a Windows Azure account (free), you can edit and deploy an ASP.NET site. You could do it on an Android tablet, on an iPad, in a boat, with a goat. Even if you're on Windows, note that the Visual Studio Online experience didn't require me to sign up for or pay anything. Visual Studio Online is free for projects with five or fewer users, and didn't make me jump through any hoops to get going. That means you can get started using it. 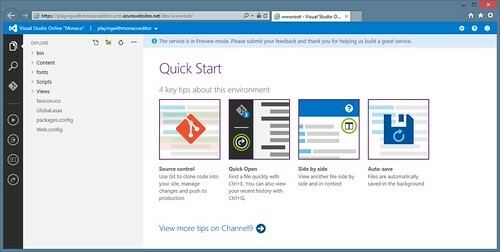 If you want more Visual Studio Online or Windows Azure services, you can get them, but there's no roadblock to creating / editing / deploying / maintaining a site right now. 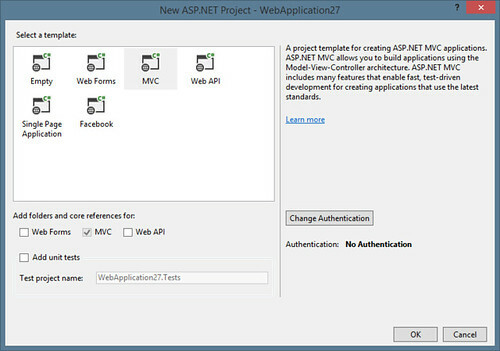 Oh, and this was ASP.NET MVC 5 - so, all the new stuff works out of the box. Yes, you'd expect that, but it's worth pointing out. Yes, we've arrived. 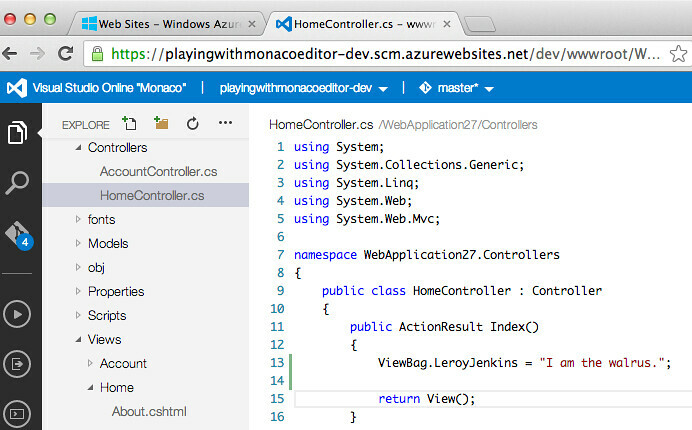 We deployed code to GitHub, pulled it into a Windows Azure Web Site, edited it in a browser, on a Mac (demo bingo, everyone drink), and saw it automatically deployed and running in a browser. Neat. What I didn't have time to show you was all the cool features in the Monaco editor. For instance, you can click on the settings gear in the upper right corner and switch to the Visual Studio dark theme, which is so much cooler. I regret that we didn't have time to look at all of the cool editor features, like the editor commands shown when you hit ctrl+E. I wish we'd had time to look at the fancy IntelliSense features, including support for jQuery function overloads. And it would have been neat to cover the cool diff-on-commit view. For those features, and many more, I recommend you check out the videos I referenced earlier. I'll even embed some of those in the next section, because this post wasn't quite long enough. All of the Monaco videos are good, but these are some of my favorite. And last, but not least, Getting started with TypeScript. Why? 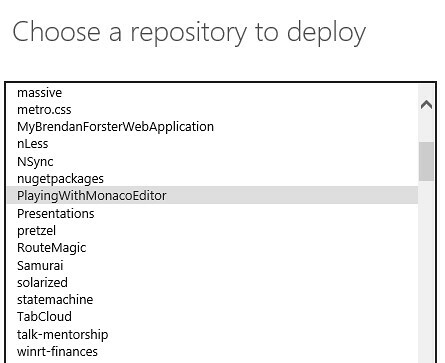 Because the Monaco editor was written in TypeScript!